Christmas is the time of year when we all run around frantically buying presents, deciding what to wear to the office Christmas Party, and getting ready for a nice break from work! Even though it’s the busiest time of the year for most people, we still want to soak up the atmosphere of the festive period. But in London, there is so much to do!! Well, Merlin Events have made it easier for you with our top 10 things to do in London this Christmas. The Enchanted Mirror at the Victoria Albert Museum is a fairy-tale adventure based on the famous story of Snow White. This is an immersive, highly interactive trail testing your investigative abilities. You must solve clues from the evil Queen, to find the Magical mirror! If you’re successful you will be rewarded! 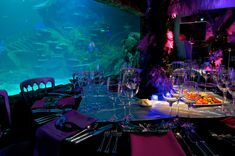 Grotto Outre is a new concept which presents a different themed event every night of the week! Take it easy through the week with a movie night, Christmas bingo and a quiz. At the weekend Grotto Outre speeds up the pace with themed festive club nights! Swap-a-HoHo is our favourite night, where guests remove an item of clothing and swap it for a Christmas item from the grotto Outre washing line each time a bell jingles. This is certainly set to keep everyone on their toes! The London Eye has launched their Frostival experience for the festive season! Selected London Eye Capsules are transformed into winter caves outlined with ice-like figures. The experience incorporates amazing views and interesting London winter facts from a personal capsule guide. There is also a fab 4D show with winter smells and sounds to enjoy before going on to the Eye! Frostival will be running from the 29th November until the 3rd January so don’t miss out on this exciting experience! The Dungeon Lates are back with a Christmas twist! 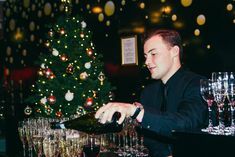 Enjoy the extremely popular Lates experience with a Christmas theme, where you have a guarantee that you are undoubtedly going to have fun! With incredible storytelling and humour throughout it’s sure to be a thrilling experience for all! You can purchase tickets here. Yes that’s right, here at Merlin we say you’re never too old to see a multi award winning show like this. Who wouldn’t want to relive their childhood with a show that creates that magical feeling?! This comical show is definitely one to see if you want to laugh and get in the Christmas spirit. Everyone loves Afternoon Tea, this is a well-known fact in England! So if you’re feeling peckish and want somewhere stylish but completely different to the usual spots, the Ham Yard Hotel is the place to go! Their luxurious Festive afternoon tea menu is available at any time in the day and is sure to suit even the fussiest of eaters! Their savoury and sweet menu items are sure to get your mouth watering! An enchanted town has sprung up in Victoria Park in East London. Featuring horse-drawn carriages, a wall of death, an outdoor ice rink and a food hall, there is no shortage of things to do at Winterville! Entry for all is free and Winterville have a lot of free entertainment too. We think this is a perfect day out for friends and families alike! Cats the musical is back this December!! We are beyond excited for this brilliant musical to return to London at the Palladium Theatre. This show is a favourite for any musical theatre lover and Nicole Scherzinger performing the role of Grizabella guarantees an extraordinary star-studded show! Book tickets now to avoid disappointment as this all-time classic will be sure to sell out quickly! The words ‘Christmas’ and ‘food’ go hand in hand, it’s the only time that’s acceptable to over indulge. The Real Food Christmas Market which is part of the Southbank Centre’s winter festival is set in the courtyard behind the Royal Festival Hall. With the finest food and seasonal goodies there is something for everyone. These are just 10 festive things to do in London that we have found this year. There are undoubtedly many, many more! We would love to hear about what you get up to with your festive activities and what your thoughts are on our Top 10!